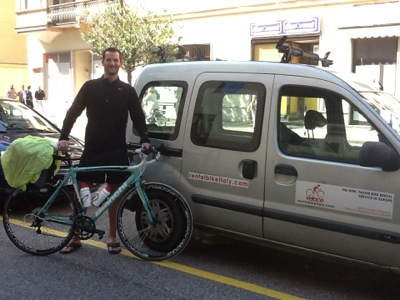 Picture from pick up delivery of high quality road bike at hotel Regina in Bolzano. Our customer rented from our company the Bianchi Via Nirone road bike with accessories like rear rack, panniers, ecc. and will ride a loop route between most beautiful Italian passes.